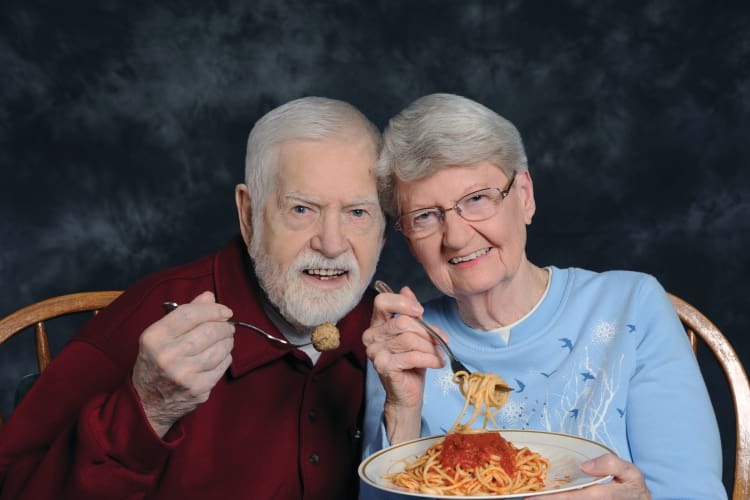 At Arbour Square, we know that access to healthy and nutritious meals combined with knowledge about making the right eating and lifestyle choices can result in healthier and happier lives for our residents. 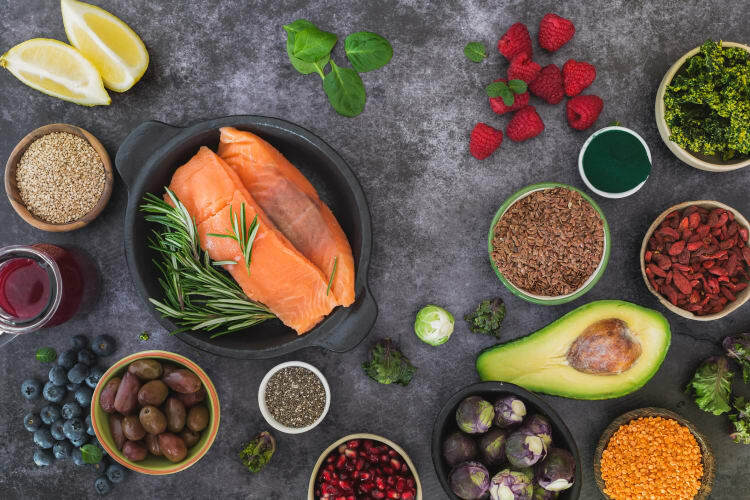 That’s why our experienced chefs prepare high-quality, and nutritious foods including personalized meals to fit most special dietary needs such as low sodium and no sugar options. During the summer months our chefs even utilize the fresh herbs and vegetables grown in the Arbour Square garden. We know that taste is important too, which is why our chefs work with our residents to offer the foods they crave. We host monthly kitchen meetings, which allow residents to participate in the upcoming meal planning to offer additions or changes to the proposed menu. The chefs will even recreate your personal recipe for the whole community to enjoy. Our Fabulous 50's Café, decorated in the style of a 1950s soda shoppe, is a favorite spot on Arbour Square’s Main Street. 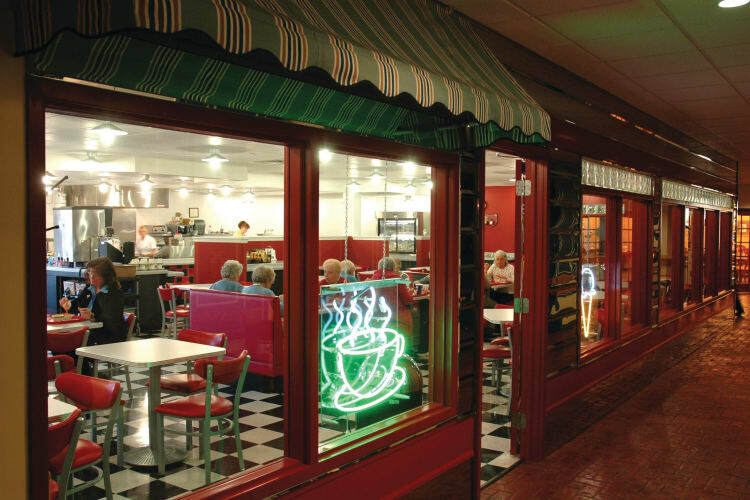 The 50's Café is always open and is a much-loved gathering place for residents. 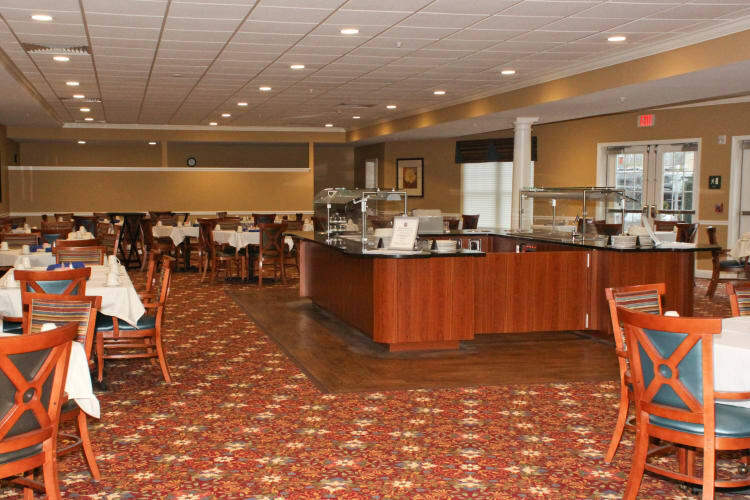 In addition to enjoying a complimentary breakfast, residents are welcome to "Grab and Go" lunch and dinner options in the café too! The complimentary breakfast at the 1950’s Café includes yogurt, cereals, breakfast bars, and toast with butter or jelly. The "Grab and Go" lunch and dinner options include a self-serve salad bar, soup and sandwich bar - perfect for residents on their way out to an appointment or coming in from shopping. Lunch and dinner are a fine dining experience within our spacious, well-appointed dining room setting at the Garden Terrance Dining Room. Our delicious meals are prepared from the freshest ingredients and our menus feature a variety of seasonal specials. At Arbour Square, our friendly staff attends to every detail with gracious and courteous service. Residents are welcome to entertain friends and family at Arbour Square. Chef Dave prepares special themed dinners twice a month centering on a particularly tasteful food or seasonal event. Take a look at this week’s menu to see an example of the meals you can expect from Chef Dave and his team. The Arbour Square dining experience is unbeatable. Dave is the Director of Culinary Services and has been working at Arbour Square since 2009. Prior to working at Arbour Square, Dave worked at The Blair Mill Inn in Horsham for 15 years as their executive chef. Dave and his wife Kimberly have three daughters and they currently reside in Jenkintown. Dave is a graduate of Johnson and Wales in Providence, Rhode Island. He was recently recognized by receiving the Gerhardt Konnecke Award of American Culinary Federation of Philadelphia for his outstanding work in the culinary industry. Greg has been an employee at Arbour Square since 2007, where he first started as a dishwasher while attending school. Greg graduated from North Penn High School and successfully completed the rigorous culinary program at North Montco Technical Career Center. After years of success in the culinary department, Greg was offered a chef position and has continued to grow as a culinary professional. In May of 2017, Greg was promoted to the position of Assistant Culinary Director and has since become a leader in the Culinary Department. Greg currently lives in Harleysville with his wife Delia and son Jason. Cathy began her career at Arbour Square in 2007 as a chef in the Culinary Department. Cathy attended Bucks County Community College and studied Culinary Arts and Dietetics. Her extensive experience ranges from fine dining to doing nutritional assessments in a healthcare setting. Cathy continues to refine her culinary skills here at Arbour Square and always looks forward to developing new and trendy menu items for Arbour Square’s residents. Cathy resides in Sellersville with her husband and two children. Kelly has been a member of the Arbour Square family since 2011 and has proven herself to be a valuable asset to our Culinary Department. She is responsible for assisting our chef’s with meal preparation, overseeing our waitstaff, coming up with new menu items for our salad bar, or ensuring that our residents receive their meal deliveries. Kelly is married and resides in Harleysville with her husband and 2 daughters. Jim works as a Chef in Arbour Square’s Culinary Department. Jim prepares a fresh variety of lunches and exciting new dinners. He has worked in the Culinary Arts for over 38 years, where he has had the opportunity to learn many different styles of cooking. In the past, Jim held an Executive Chef position with a University, private restaurants, and banquet facilities. Jim is married and currently resides in Perkasie. He has one daughter, and 2 wonderful grandsons. He enjoys being outdoors with his two dogs, riding his motorcycle, and shooting sports. Chris is one of the chefs in culinary services at Arbour Square and has worked here since 2014. He has been working in the culinary industry for over 15 years. Chris resides in Pennsburg with his wife, two sons, and daughter. Outside of work, he enjoys watching his two sons play baseball, going fishing, and hunting. My mom and dad just moved into Arbour Square. From the first time we visited Arbour Square the staff has been so helpful, kind and caring. They take time to know the residents by their names and what they need and prefer. The family has visited mom and dad. The dining staff made all of us feel very welcome. Nothing is to much trouble. The dining staff even took time to make sure that the young great-grandchildren where taking care of. The family is looking forward to many visits with mom mom and grandad. It is comforting to know that they are happy, busy and content in their new home. Contact us today schedule a personalized lunch and tour.